Marshfield lost another great citizen this weekend: Pat Roche. I did not know him well, but I recognize Pat and Barbara's spirit in their many great, local charitable works. As a result of their many contributions to the community they were named Marshfield Citizens of the Year for 2011. They were to receive their award this coming month. I’m sorry that Pat won’t be here to revel in our town wide celebration for him. 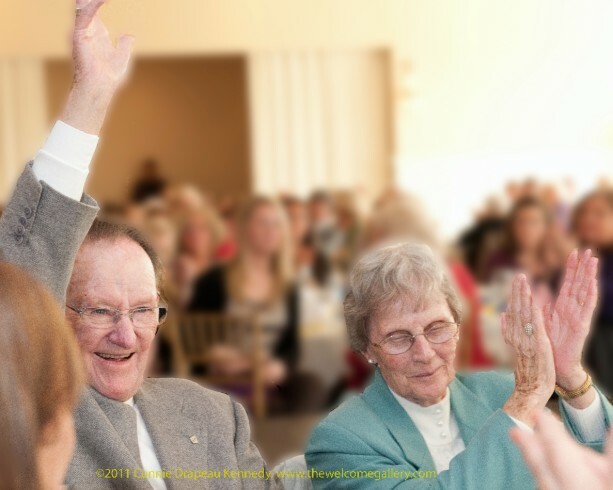 Mary Jane Hanron described Pat Roche’s willingness to help our community organizations in the April 18, 2012 Marshfield Mariner article announcing the Citizen of the Year awardee(s): http://www.tinyurl.com/COTY02050 . This weekend Mary Jane also notified us of Pat's death: http://www.tinyurl.com/PatRoche . Last fall the Roche Bros. supermarket company was one of two platinum sponsors at a great fashion show produced by the spirited Friends of Sowing Seeds to benefit the work and people served by Sowing Seeds Ltd. in Marshfield. After re-reading Mary Jane’s article I searched my archives for this photo. I will always recall him as “The Man Who Raised His Hand.” It fits. Just ask the Marshfield Boys and Girls Club, Habitat for Humanity and perhaps dozens of other local organizations. Thank you, Pat, for your many great works. Thanks also for a beautiful, service-oriented, inviting, local market. Condolences to your family, friends, colleagues and employees. Although you will be missed you surely left your mark and many wonderful charitable works. Thank you. Pam Snell - Wonderful photo! Pat hated to have his photo taken; he would have loved this one!